Give a message of inspiration and motivation with our uplifting Cervical Cancer Awareness T-Shirt. Our Cervical Cancer T-Shirt is a great way to spread awareness and give others hope that they too can beat this disease. 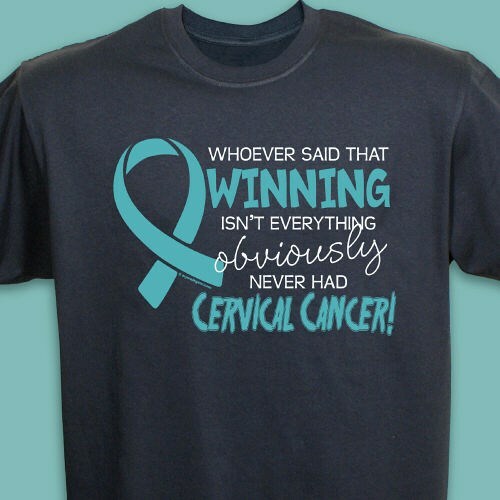 Our Cervical Cancer Awareness T-shirt is available on our premium 100% cotton T-Shirts, machine washable in youth sizes XS-L & adult sizes S-3XL. Additional Info January is Cervical Cancer Awareness Month. Show your never ending support for cervical cancer warriors, advocates & survivors with our collection of Cervical Cancer Awareness Apparel & Walk Gear. View more designs & inspirational gift ideas such as our Fight Like A Girl Tote Bag & our Hope Hooded Sweatshirt as well.